A magical explosion of mail has occurred high over the streets of Melbourne! 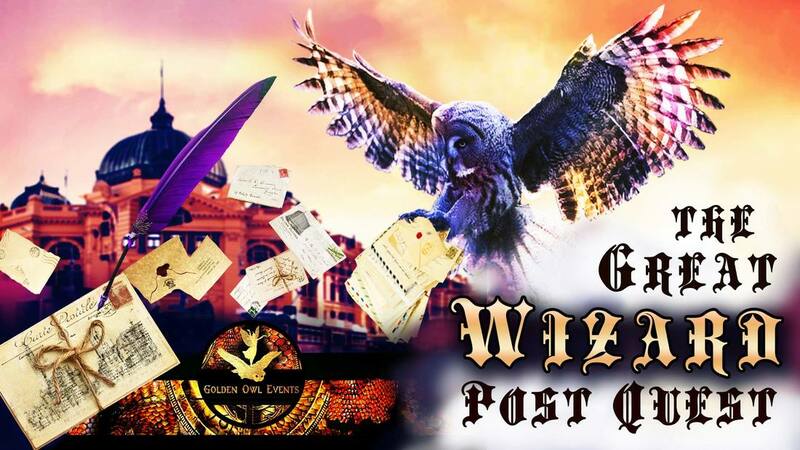 A parcel containing an energetic Quick Quill has burst open and run amok in the Owl post bag, scribbling on letters and causing envelopes to fall everywhere! 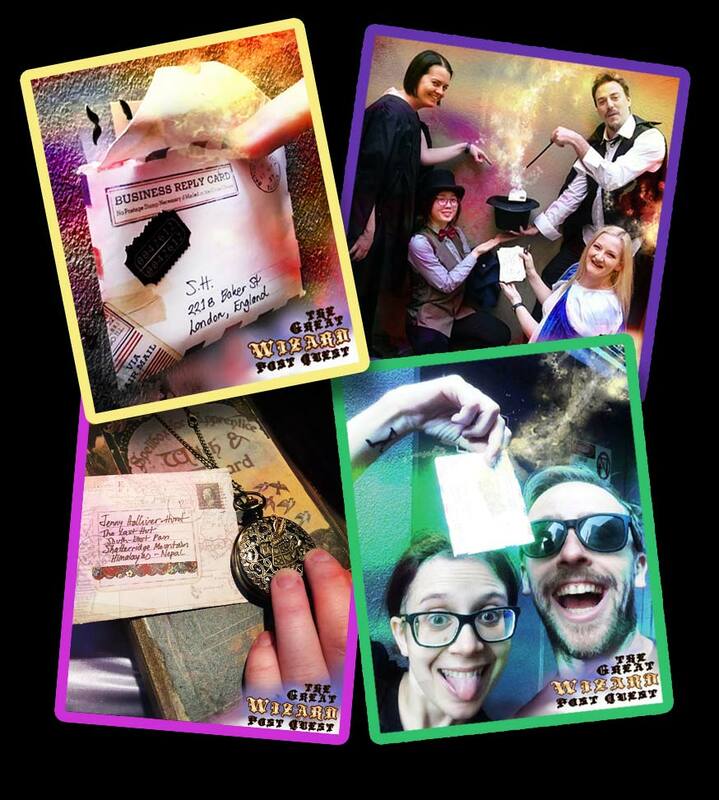 You have two hours to find all the fallen envelopes and collect all the clues. ​was writing and hand it in to WIN THE GAME! World-renown Magi-Zoologist and Adventurer Sage Sinclair has been exploring the furthest jungles and roughest terrains in order to study rare magical creatures. Sinclair has discovered and documented a variety of exciting new species with magical properties, each time recording their finds with the help of their trusty and hard-working Quick Quill, affectionately called 'Whipper'. Sinclair and Whipper have built their reputations by exploring remote areas and going where few would dare to tread in order to carefully study fantastic beasts in their natural environments. Sage Sinclair was recently invited to Melbourne to be an honoured guest lecturer at Varinor Academy of Magical Arts and Sciences. Before appearing in public, Sinclair decided Whipper deserved a much-needed dose of Tender Loving Care, since storms, sun and all manner of weather had taken their toll on poor little Whipper. Sinclair carefully packaged up Whipper and sent it via Owl Post to the very best professional wands and quills repair workshop in Melbourne, Aardvark & Artemis. Just before reaching its destination, Whipper burst free of its packaging, giving the Owl carrying it such a fright it flew off course and straight into another post Owl carrying a large bunch of mail. Magical mail fluttered out of the sky. In a panic Whipper started writing on every piece of paper it touched as it fell, reciting from memory one of Sinclair's adventures. Fortunately two local witches, Crystal Wellington and Plum Madrid, witnessed the crash and were able to immediately recover both the two owls and Whipper. However, several envelopes were scattered by the wind are still lost and unaccounted for. It's up to you to find them all! 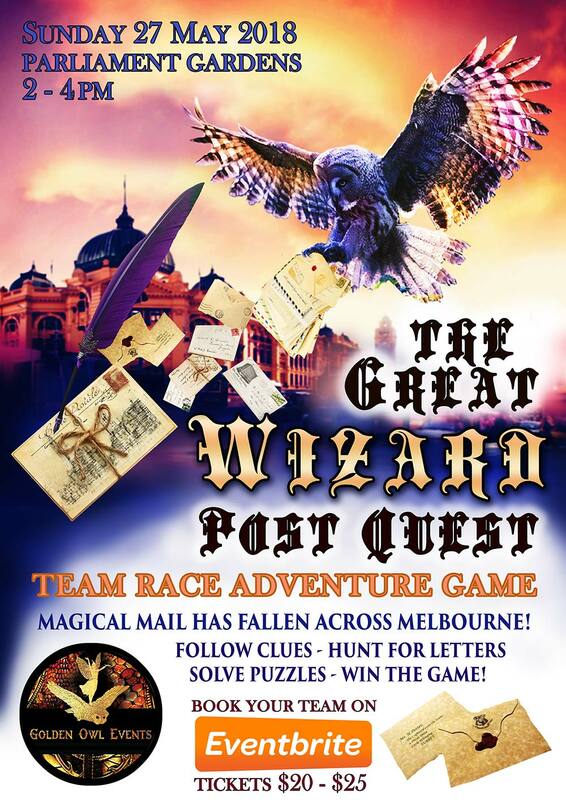 This is an exciting outdoor competition for those who like treasure hunts, exploring the interesting nooks and hidden spots of Melbourne and running about with friends! 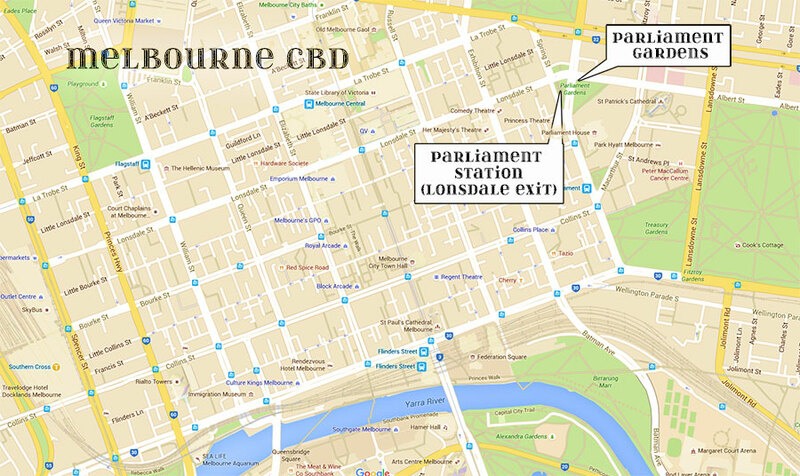 So far Golden Owl Events has run "Where In Melbourne Is Carmen Sandiego? ", "Pirate Quest", "The Great Gryphon Feather Quest" and "Faery Quest". This is our second "Great Wizard Post Quest". You have 2 hours to find as many letters as possible. The will be hidden across a secret location area that shall be revealed on the day. The game is designed to be completed within about an hour at a brisk walk. 2 hours are given for slower players. After 2 hours has elapsed the game will end and all the magical components will be swept away! All of the letters are accessible on foot. Some may be 'off the beaten path'. ​This game is designed to be played in teams. A team of 3 - 4 is ideal. You can also play in Pairs or Solo if you wish. This game is made for adults to enjoy, but kids can play too. Recommended for players 10 and up. Younger kids must have at least one adult player on their team. Quills and Magnet Prizes will be awarded on the day. These prizes will be handed to Teams as they complete the game and 'cross the finish line' at the final checkpoint location. 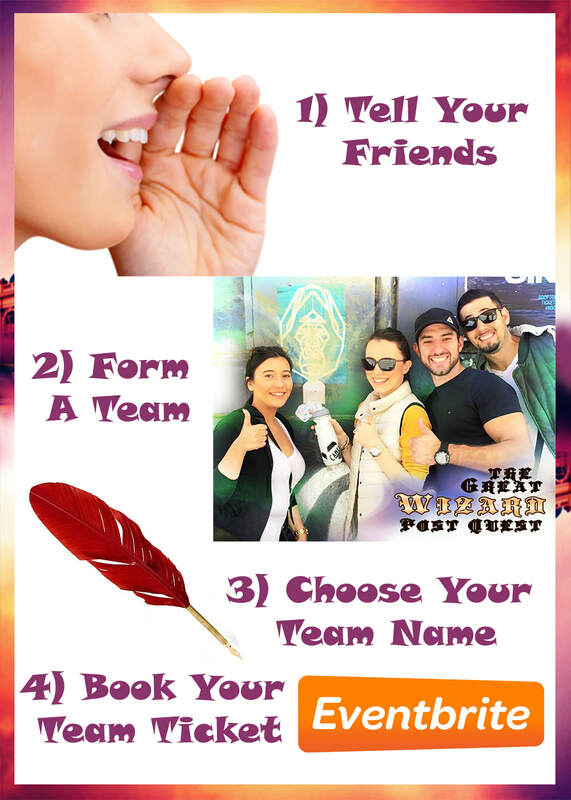 Take Team Selfies and upload them on the Facebook Page! The winning photo will be chosen by the Golden Owl Events judges, from the shortlisted 'Popular Vote' photos that have the most 'Likes / Reacts'. Judges will be looking for energy, excitement, fun, colour, expressive faces, and a good shot that shows the players in action during the game, either hunting for or finding envelopes, or working on solving clues together. Players can use any camera and any method to take photos, e.g. selfies, ask someone to take a group shot of you, etc. Participants will have 3 days to upload and vote for photos. The Winning Photo will be chosen and announced on WEDNESDAY 30th MAY 8pm on the Facebook Event Page. Prize Money will be sent via bank transfer after email arrangements with the Team Captain of the winning team's photo, who can then distribute the Prize Money to their teammates as they see fit. 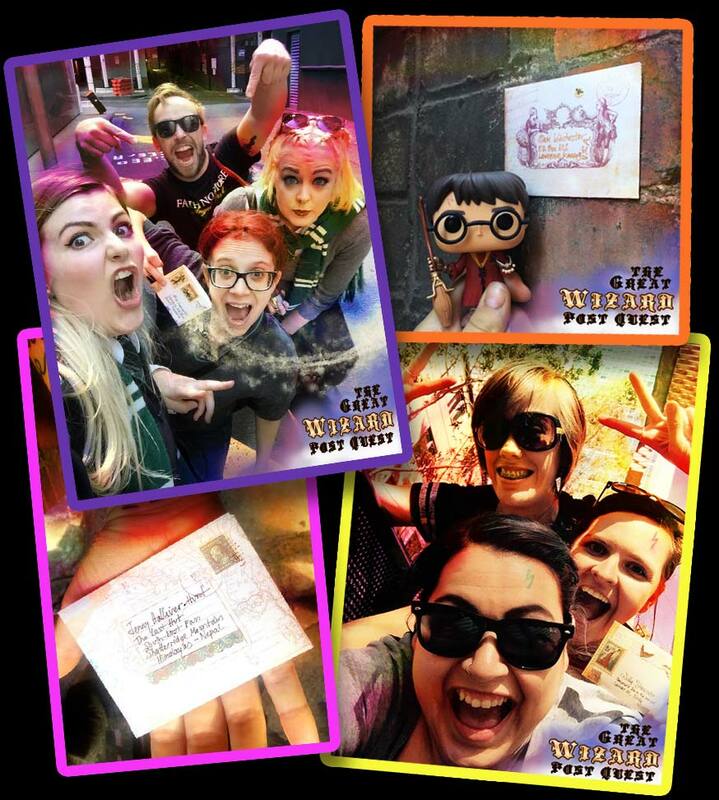 TO ENTER: Post your photo on the Great Wizard Post Quest 2018 Facebook Event Page. 1) Title: "Photo Competition Entry"
Selected submitted photos may be displayed on our Golden Owl Events website and social media pages after the competition. Likes, Facebook reactions and comments will be taken into the consideration by the Judges when choosing the winner. Popular votes will be used to shortlist the finalists. TO VOTE: Like any photos you think deserve to be shortlisted. You can like / emoji as many photos you wish, including your own team's photos. Kids aged 7 and under are free. TICKET BOOKINGS on Eventbrite will CLOSE FRIDAY 25 MAY at 11:30pm. WHAT WILL I NEED TO PLAY? There are a few water bubblers / drinking fountains around the gameplay area, and cafes nearby for mid-game snacks / drinks. Public Toilets are available close by. ONLINE TEAM REGISTRATIONS WILL CLOSE FRIDAY 25 MAY at 11:30pm. If you are buying your tickets on the day you also Register Your Team on the day, whether group, pair or solo. 4. Go to the End Point to complete the Quest, hang out with the other players, have a coffee and some food, and find out which teams were the fastest! This game requires players to be reasonably active and mobile. It involves a lot of walking (or running if you're really keen) and takes a certain amount of stamina. The game is played entirely on foot. Players will experience varying terrain during the Quest, including staircases, gravel paths, rocky areas, slopes, grassy areas and narrow dirt paths. There may also be large puddles and mud if there's been recent rain. People unable to climb stairs, cross varied terrain or walk for 2 hours. Small children are not recommended to play as they pretty much never have the endurance to last the whole length of a Quest, in our experience. If a letter comes unstuck from the wall as you are handling it make sure you stick it back to the wall after you've collected the information you need. If you can't stick it back up for some reason, e.g. the wall is wet, just leave it on the ground where you found it and our Game Guardians will attend to it.